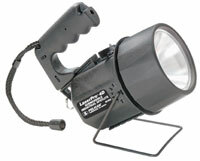 Industrial/professional quality multi-use spotlight. Dual filament Xenon Laser Spot safety lamp. Double switch. Burns 30 hours per filament (60 hours total). Battery burn time is 10-12 hours on 4 D-cell alkaline batteries (not included). Multiposition handle fits gloved hands. "O" ring sealed. Adjustable fold away stand. Heavy duty Protective lens shroud and internal battery shock system. Floats beam up. Supplied with lanyard and equipment clip ring. NO 125.7 7 60,000 4D 10-12 hours 8 3/8" 2.87 lbs.